I walked closer. Placed my feet in position. Gripped the bar, hard. Set my stance. Took in a deep breath. Contracted my core. And, lifted the weight off it. Took one step back and another. I was ready. “3-2-1-GO!” he screamed. At the end of the set, my shoulders were burning, my legs wobbled. I asked him, ‘How much?” he responded, “35kg.” I nodded. The bar had been raised and I accepted it, albeit with every muscle rising to the challenge including the biggest of them all – my mind. Fitness and weightlifting have taught me 6 lessons on Victory in life leadership. It’s not how much you do, it’s about how committed are you to want what you want. To get out there on the mat, no matter what tales your mind spins to discourage you. No matter how important ‘work’ is or how stressed you are about a deadline. Like in any goal of your life, commitment is the key to success. Give nothing less than everything. It’s all about the right range, form and technique not about how long you work out. The focus is on intensity. What is the quality of your input- in life, how focused are you in your relationships, your attitude towards your career or health? Spending a day with your loved ones, stuck to your phone, will do nothing to enhance your family life. Doing something meaningful, will. Believe in your strength. If you can’t then talk yourself into it. No one knows you better than you do. Sometimes, the stories you have about yourself, don’t belong to you. 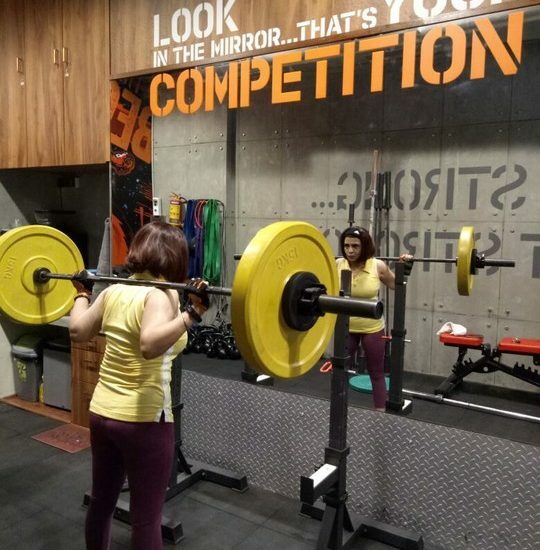 When I couldn’t lift 40kgs, I decided to talk myself into it. Four weeks ago, I hit the 50kg mark. I was the same person. What changed was the story I told, myself to convince myself, I can do it. Life will throw challenges at you, and some may even seem insurmountable. It’s not the load that breaks you down, it’s the way you carry it. Let go of thoughts that do not make you stronger. Self-belief and conversations that empower and elevate you, decide your victory. A few days ago, I hit the 40kg mark on the deadlift. My trainer suggested we move towards 50kgs. The weights were added, I walked up to it, tried to pick it up and realized, I couldn’t lift it. People were watching me. I tried again and the bar wouldn’t budge. Quitting is not what I do however you need to know that it’s okay even when you fail. Not everything you do in life is geared towards a triumph and you need to understand and accept it. It is alright. Calloused palms, scraped calves, bruised shoulders, grazed elbows, sore muscles, are the gifts of physical training. There is no comfort except in the knowledge that it will be all worth it in making you stronger physically and mentally. Similar to life, which comes with its fair share of trials and tribulations in the form of the pain of loss, disappointments, hurt when you’re pushed out of your comfort zone. That’s when you grow to be better than who you are – to be that special YOU. You’ll never know your strength until you pushing the bar. Had I quit, every time, I was given a new barrier to climb over by my trainer, I wouldn’t even realize what I was made of. Life will keep throwing obstacles at you, new challenges, too and they are signs for you to step up to your game. And, lift away the pain. Step up, face and raise the bar in training as in life to achieve victory. Believe you are a victor, stay humble, respect the bar, face the bar and raise the bar at every step of your life. The meaning of life is not to simply exist or survive but to climb higher, conquer peaks and be victorious for that is what you are meant to be.